With a major extension of LuK RepSet 2CT range, Schaeffler launches new dry and wet clutch repair solutions for the Automotive Aftermarket. with applications for Fiat, Renault and Smart models and the LuK RepSet 2CT is now available for vehicles such as Audi, Skoda, Seat and VW in the VW Group using wet double clutches. A major advantage for drivers of vehicles with a double clutch is that it allows gear changes without any interruption of the power transmission. This innovative product ensures greater driving comfort and lower fuel consumption. Recognising early the potential of the technology for the aftermarket, Schaeffler became the pioneer of this technology when it developed the LuK RepSet 2CT repair solution. With the latest addition the aftermarket division now also has this repair solution for the Smart, Renault Captur and Clio, vehicles in the Fiat Group (petrol and diesel) for Fiats, Alfa Romeos and Jeeps with the 6-speed FPTC635 DDCT gearbox and for Suzuki (petrol and diesel models with 6-speed TCSS transmission). 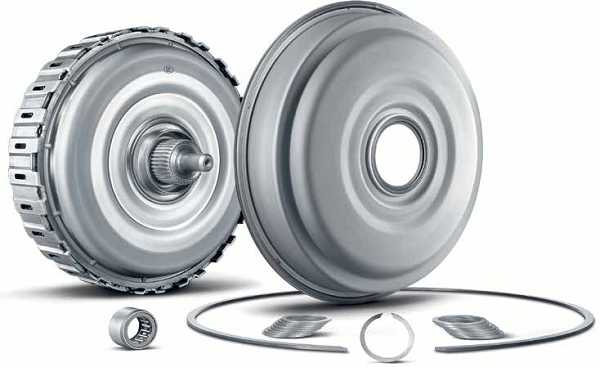 In addition, Schaeffler also offers repair solutions for the wet double clutches used by Audi, Seat, Skoda and Volkswagen with the 7-speed DQ500 gearbox. “With these new applications for both dry and wet double clutches we once again demonstrate our innovative power and years of competence in clutch repair,” said Rouven Daniel, Head of Transmission Systems at Schaeffler Automotive Aftermarket. “Our global market coverage in the clutch segment is already 80 per cent and this will increase further,” he said. The principal behind double-clutch technology is complex but can be simply explained as follows: at the same time one clutch is transmitting torque the second clutch is being positioned for the next gear. This facilitates the smooth shifting from one gear into another without any drop in power transmission or performance. The dry double clutch is used especially in vehicles with lower torque due to the resulting heat which cannot otherwise dissipate. By contrast, the wet double clutch is used mostly in vehicles with especially high drive torque of over 250 Nm. The oil cooling effect of the oil enables the transmission of higher torque levels. In this version the heat that results during shifting and acceleration from a standing start dissipates in the oil circuit. Whether it’s a dry or wet version, every LuK RepSet 2CT not only comes with the double clutch but also it contains all the components required for repair that have been precision tuned for replacing a specific double clutch system. The product is completed by the appropriate modular special tool system that is required for replacing the double clutch. The vehicle specific tool sets for each application can be easily combined with the basic tool set. Every LuK RepSet 2CT and special tool case comes with detailed information about the technology and installation in eight languages. Division at the REPXPERT online portal www.repxpert.com.au On this site registered users have access to all technical information including installation videos and technical brochures and at the same time accumulate bonus points which can be exchanged for products.